President Tran Dai Quang and his Egyptian counterpart Abdel Fattah el-Sisi discussed measures to promote trade and investment between the two nations during their talks in Hanoi on September 6. The talks took place during the Egyptian President’s State visit to Vietnam from September 6, which is the first by a State leader of Egypt to Vietnam since the two countries set up their diplomatic relations on September 1, 1963. They affirmed their shared intention to increase two-way trade to 1 billion USD soon via promotion of investment, and trade between the two nations. The Presidents agreed on the importance of boosting cooperation in the fields of industry, agriculture, fishery, transport, culture, tourism, education, security-defence, as well as local-level cooperation. The Vietnamese side welcomed Egypt’s offer to provide technical assistance and expert training for Vietnam in meeting Halal standards for goods, while the Egyptian side backed Vietnam’s initiative to forge trilateral cooperation among Vietnam, Middle East – African nations and a third party. On the political front, the two Presidents were unanimous on increasing the exchange of delegations at all levels through the channels of the State, Parliament, Government, party, locality, enterprise and people-to-people. The two leaders lauded the bilateral cooperation at multi-faceted forums, particularly in the framework of the United Nations (UN), the Non-Aligned Movement, and the International Organization of the Francophonie. President Quang extended his thanks to Egypt for backing Vietnam’s candidacy at the UN’s important agencies, including the non-permanent membership at the United Nations Security Council for the 2020 - 2021 tenure. The two Presidents shared their views on international and regional issues, affirming their support of regional and international efforts against terrorism, and seek peaceful measures for crises in the Middle East. The Egyptian President voiced his support for Vietnam’s efforts to maintain peace, stability, prosperity, saying that all disputes must be settled by peaceful means on the basis of principles of international law, and the 1982 United Nations Convention on the Law of the Sea. The Presidents recalled the late President Ho Chi Minh’s three visits to Egypt, urging the culture sector of the two nations to continue research on this period in history. They agreed that Vietnam and Egypt will jointly organise practical activities to mark the 55th anniversary of the diplomatic ties in 2018. 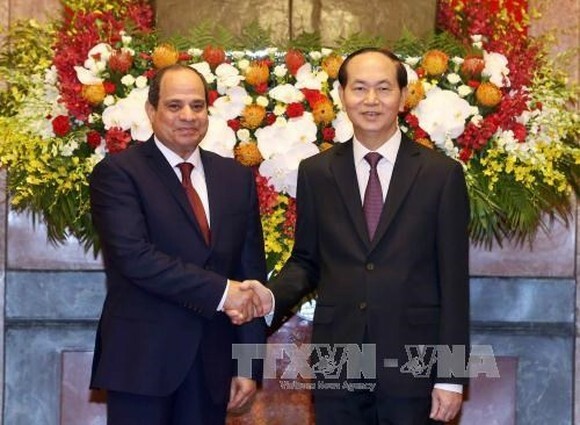 President Abdel Fattah el-Sisi invited President Tran Dai Quang and other Vietnamese leaders to visit Egypt soon. Earlier the same day, the Egyptian President laid wreaths in tribute to President Ho Chi Minh at his mausoleum, and at the War Martyrs' Monument in Hanoi.